We’ve all had one … The horse that hates being wormed, that just won’t stand for it and just doesn’t make worming easy. So, out-think your horse with a little patient brainwashing. Try this simple method of getting him or her to look forward to the worming syringe rather than shy away from it. Once your horse learns this lesson, worming will become very easy and stress-free for both of you. Thoroughly wash and dry an old empty worming syringe. Fill the syringe with some apple sauce. You can make your own or use a jar of supermarket own brand. Make sure you leave a little on the outside of the syringe tip. 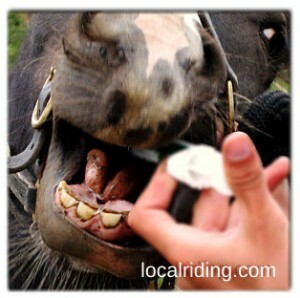 Just before your horses feed, inject the apple sauce into your horse’s mouth, just as you would a standard wormer. Do this daily until your horse accepts the syringe without fuss. The next time you have to worm your horse, use the apple sauce trick for 3 days before worming and 3 days after. For more information on worming check out our worming page and make sure you download and print your free worming programme.